This past week, the Institute for Science and International Security released a commercial satellite image showing heavy machinery tracks as well as trucks and heavy construction equipment at North Korea’s Yongbyon nuclear complex, near the area where the cooling tower for North Korea’s nuclear reactor once stood. It is not clear what North Korea is doing. Is North Korea attempting to reconstruct the cooling tower? Perhaps. On the other hand, much of the equipment appears related to excavation, which would seem to suggest some other activity. What is clear is the political symbolism of the site itself. The Six Party Process, at least as we knew it, is dead and buried. The trucks and other vehicles are driving over its grave. The destruction of the cooling tower at North Korea’s Yongbyon nuclear facility was a made-for-TV event. Literally. As part of the September 2007 “Six-Party Agreement” on denuclearizing the Korean Peninsula, the Bush Administration carefully negotiated a series of 12 steps to “disable” North Korea’s plutonium production infrastructure (See Box: Disablement Steps). The destruction of the cooling tower is intended by U.S. officials to be a striking visual, broadcast around the globe, that would offer tangible evidence that North Korea was retreating from its nuclear ambitions. Wisps of vapor from the cooling tower appear in most satellite photographs of Yongbyon, making it the facility’s most recognizable feature, though experts say its destruction would be mostly symbolic. It is this symbol that North Korea is busily erasing, making plain that the Six Party Talks are dead. The “good visuals” of blowing up the cooling tower were also a perfect metaphor for the inherent dishonesty of the Six Party Talks. The Bush Administration had campaigned on a critique of how the Clinton Administration negotiated the Agreed Framework, a critique that turned out to be in equal measures partisan, convenient, and facile. Once in office, the moderates set about devising ever more elaborate measures to preserve the fiction that the Bush Administration’s engagement with Pyongyang was somehow different from the Clinton Administration’s. Hardliners in the Bush Administration were able manipulate Bush’s fear of looking like Clinton, delaying negotiations for years and ultimately strangling the deal reached in 2007. The farce began with the insistence on the “Six Party Talks” format. Officially, Administration officials claimed that a multilateral venue was essential to place pressure on North Korea. In reality, however, having a crowd around the table mainly served to distinguish the policy of Bush Administration from the bilateral efforts by the Clinton Administration. The predictable result, however, was to impede talks with North Korea. When Jack Pritchard, U.S. ambassador and special envoy for negotiations with the North Korea from April 2001 until September 2003, learned of the condition that there were to be no bilateral contacts with the North Koreans, he predicted the “the North [Koreans] will walk out” and submitted his resignation. As Pritchard predicted, the North’s response—initially, at least—was to walk out. This fiction continued through a significant portion of the Six Party Talks, at some points forcing American officials to meet with North Koreans in one corner of the room, while South Koreans, Chinese and Japanese milled around out of earshot. Eventually, of course, moderates in the Administration were able to work around the prohibition on direct talks. Yet there were other self-imposed constraints. One was opposition to the idea of a “freeze” on North Korea’s plutonium program—the term having been rejected as too “Clintonian.” Instead, the Bush Administration insisted that it was interested only in the complete, irreversible, and verifiable dismantlement (CVID) of North Korea’s nuclear program. As a result, the “shutdown” negotiated in September 2007 included measures for “disablement”—a made-up word to describe a modest set of technical measures that would lengthen the time for North Korea to restart plutonium production after a shutdown. The Bush Administration’s stumbling over the hopelessly inelegant disablement process testified to the lengths they were prepared go to confound themselves in proving that this time was somehow different. Removal and storage of all three uranium ore concentrate dissolver tanks. Removal and storage of all seven uranium conversion furnaces, including storage of refractory bricks and mortar sand. Removal and storage of both metal casting furnaces and vacuum system, and removal and storage of eight machining lathes. Storage of the remaining UO3 powder in bags with monitoring by IAEA (this constitutes nearly five tons of powder). Cut and removal of portions of steel piping of the secondary cooling loop outside the reactor building. Removal of the wood interior structure of the cooling tower. Discharge of 8000 spent fuel rods. Removal and storage of the control rod drive mechanisms. Cut cable and removal of drive mechanism for trolley that moves spent fuel caskets from the fuel receiving building into the reprocessing facility. Cut two of the four steam lines into the reprocessing facility. Removal of the crane and door actuators that permit spent fuel rods to enter the reprocessing facility (at Level -1). Removal of the drive mechanisms for the fuel cladding shearing and slitting machines (at Level -1). But once again, opponents of an agreement skillfully manipulated the President’s fear of looking like Clinton to impose demands that were designed to strangle an agreement, not strengthen it. Opponents insisted on humiliating the Kim regime under the guise of verification. 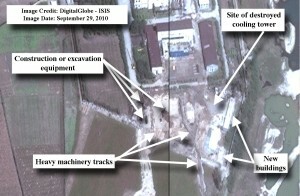 At one point, frustrated moderates described the measures developed by the State Departments hard-line Verification, Implementation and Compliance (VCI) Bureau—in a formal memo no less—as a “nationwide proctology examination.” Verification demands hobbled both a September 2005 agreement on denuclearization, as well as the September 2007 agreement on disablement. In the latter case, the hardliners’ demands appeared in the Washington Post: “full access to any site, facility or location” in North Korea. Not surprisingly, the North Koreans balked at Washington’s intrusive demands. Washington claimed that North Korea’s declaration of activities was incomplete and that further access on verification was necessary. North Korea insisted that Washington follow-through on its commitments to “delist” North Korea as a state sponsor of terrorism before accepting additional measures. The Six Party agreement simply stalled, as North Korea slowed and then halted disablement measures. At some point, Kim Jong Il suffered a stroke. The Bush Administration eventually did remove North Korea from the list of state sponsors of terorrism, but the North Koreans—perhaps because Kim was incapacitated—refused further demands for verification and talks collapsed in December. As the Obama Administration entered office, it seemed caught off guard as North Korea conducted new missile tests, followed by a second nuclear test, and then completed restarting the “disabled” reprocessing facility. The North Koreans are aware, of course, that the United States can see the activities at the Yongbyon site. They must also presume that activity at the site of the cooling tower would be understood in light of the intense diplomacy just 26 months ago to knock it down. The farce is over. We are now free—if we wish to be—from the Six Party format, CVID, disablement and all the rest of the rituals designed to preserve the Bush Administration’s vanity, which failed to prevent hardliners from under mining negotiations with North Korea on the pretext of strengthening the agreement. In doing so, the hardliners were able to avoid defending the alternative of attempting to completely isolate North Korea, and the inevitable costs of such a strategy. This is not to say that the Six Party Agreement did not, in some respects, improve upon the Agreed Framework. But those improvements were small compensation for a dysfunctional process meant to shield the Bush Administration from accepting a fundamental reality. The Vice President’s boast that “we don’t negotiate with evil, we defeat it” was hot air. In the real world, policymakers do reach agreements with governments we neither trust nor would wish to live under. Among a series of unpleasant options, however, negotiating with North Korea was still the best of a bad lot. If we want to manage the problem posed by North Korea’s nuclear programs, ultimately we must negotiate directly with North Korea as it is, not as we would wish it be.